An artist’s concept of a Lockheed Martin LRASM fired from a U.S. Navy VLS tube. Lockheed Martin image. The Navy plans to hold a competition for an anti-ship missile that could be used from the air or ships and possibly submarines to beef up the service’s ability to take on surface threats, service officials told USNI News this week. The Offensive Anti-Surface Warfare (OASuW)/Increment 2 anti-ship missile will follow an authorization earlier this year for an air-launched missile currently being developed by Defense Advanced Projects Research Agency. The analysis will be used to guide the Navy’s investments in Fiscal Year 2016 and beyond. Service officials did not specify a planned timeframe for the completion of the updated analysis or subsequent requests for proposals from industry. “Surface and air-launched material solutions will be assessed,” the Navy said in a statement provided to USNI News. The OASuW Increment 2 would be a follow-on to DARPA’s Long Range Anti-Ship Missile (LRASM), which is based on Lockheed Martin’s AGM-158B Joint Air-to-Surface Standoff Missile-Extended Range. The Pentagon authorized the Navy to put the LRASM into production for the OASuW/Increment 1 requirement on Feb. 3. The Navy will complete the development, test and integration of the Increment 1 weapon onto the Boeing F/A-18E/F Super Hornet and the U.S. Air Force’s Rockwell International B-1B Lance strategic bomber. 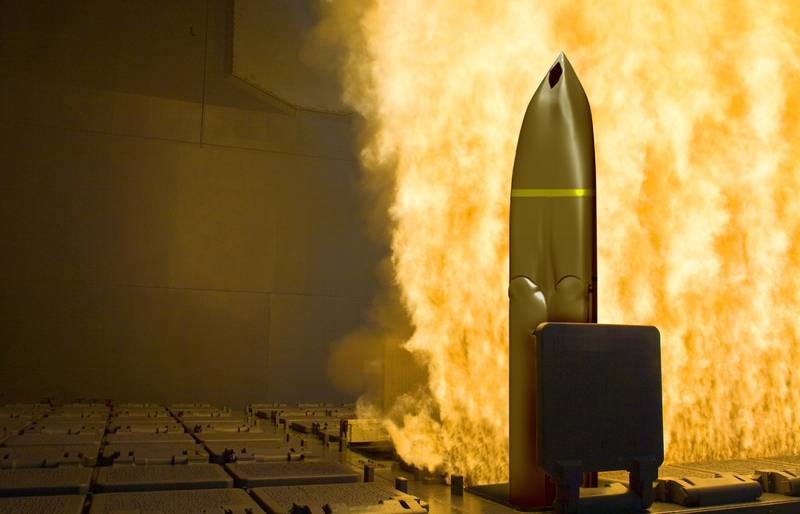 Even though DARPA has been developing the LRASM as a weapon capable of being launched from the air or vertical missile launch tubes on the service’s ships, the Navy will use it strictly as an air-launched missile, Navy officials told USNI News on Thursday. “Production of air-launched LRASM is planned to commence in FY 2017 to support employment of an early operational capability to both the Air Force and Navy,” Navy spokesman, Lt. Rob Myers, told USNI News in a statement. The Pentagon was forced to embark on developing the LRASM as an urgent capability because the existing Harpoon missile does not have the range or survivability to defeat emerging surface threats. The Navy has not prioritized defeating enemy warships at sea since the collapse of the Soviet Union. The degradation of the Soviet fleet following the end of the Cold War ended the last major peer threat to American naval dominance until the Chinese People’s Liberation Army Navy began a rapid modernization program in the late 2000s. Now the Navy is scrambling to counter what it sees as a rising threat. But LRASM is merely a stopgap for the Navy until it can develop a more comprehensive solution in the form of the OASuW Increment 2—which will be used by aircraft, surface warships and possibly submarines. In the last few months Navy officials have indicated the service needed to improve the offensive power of its current fleet. Dave Majumdar has been covering defense for over six years. He has written for Flight International, Defense News and C4ISR Journal. Majumdar studied Strategic Studies at the University of Calgary and is a student of naval history.